HONOLULU — With no fanfare, Honolulu International Airport was renamed after the late Sen. Daniel Inouye, effective April 27. The airport tower does not yet reflect the name change, but the airport’s website now bears the name of Daniel K. Inouye International Airport. The official three-letter acronym for the airport is still HNL. Tim Sakahara, spokesman for the Hawaii Department of Transportation, told local ABC affiliate KITV that state lawmakers requested the name change during the last legislative session and it was approved. The DOT says that it is working with Inouye’s family to coordinate a ceremony and that an official announcement will be made around Memorial Day. Survivors include his wife, Irene Hirano Inouye, and son, Ken. Inouye International — the principal aviation gateway of the City and County of Honolulu and one of the busiest airports in the U.S. — was originally called John Rodgers Airport in 1927 (named for a naval officer who attempted the first nonstop flight from California to Hawaii), then became Honolulu Airport in 1947 and Honolulu International Airport in 1951. 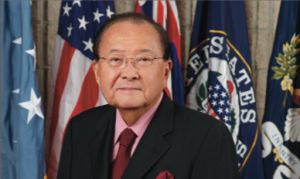 Inouye, who died in 2012 at the age of 88, steered federal funding to the airport during his 49-year tenure in the Senate, which began in 1963. He served as president pro tempore of the Senate and chair of the Appropriations, Commerce, Indian Affairs and Intelligence committees, and was a prominent figure in the Watergate and Iran-Contra investigations. He posthumously received the Presidential Medal of Freedom from President Obama. A graduate of the University of Hawaii at Manoa and a decorated veteran of the 442nd Regimental Combat Team, Inouye was elected to Hawaii’s Territorial House of Representatives and Territorial Senate in the 1950s. When Hawaii achieved statehood, he became the state’s first U.S. congressman in 1959. Since his passing, several schools, military installations and other institutions and other sites in Hawaii and on the mainland have been named after the late senator, including the Daniel K. Inouye Center for Democratic Leadership at UH Manoa, Daniel K. Inouye Highway (formerly Saddle Road) on the Big Island, Daniel K. Inouye Terrace at the Smithsonian National Museum of the American Indian, and Sen. Daniel K. Inouye Field at Fort Benning in Georgia.